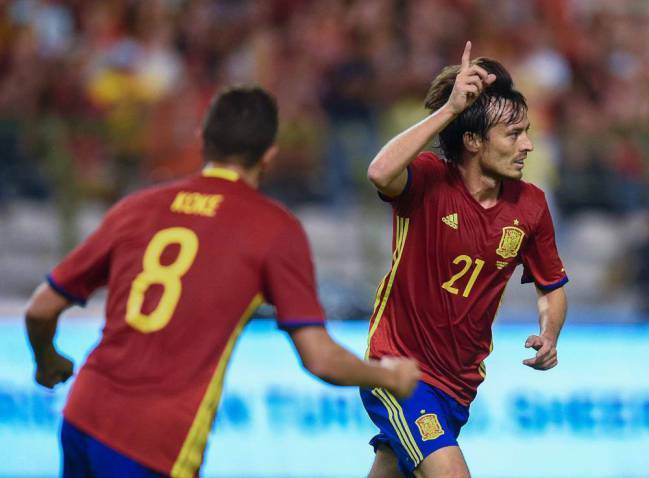 David Silva grabbed a brace as Spain began life under Julen Lopetegui with a deserved 2-0 friendly win over Belgium at the King Baudouin Stadium on Thursday. 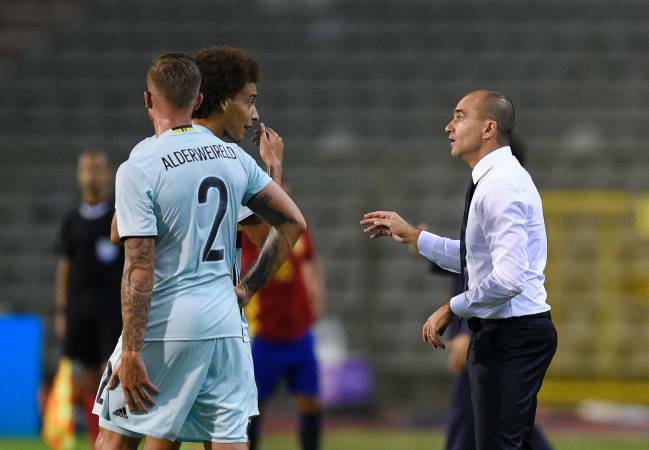 Belgium, also playing their first match under a new coach in Spaniard Roberto Martínez, were second best as the visitors overcame an injury to striker Álvaro Morata to dominate in Brussels and prepare for Monday's opening World Cup qualifier against Liechtenstein in ideal fashion. Limping off midway through the first half, Morata was replaced by the recalled Diego Costa, and the Chelsea man - who went on to deliver a highly encouraging display - had not been on for long before being involved in the goal that put Spain ahead. Dani Carvajal's pass released Vitolo running into the area and, having rounded keeper Thibaut Courtois, the Sevilla winger's cut-back saw Costa touch it into the path of Silva, who fired the away side 1-0 up from close range. Having gone in at the break in complete control, Spain continued where they left off after half time. Gerard Piqué and Costa both went close, before Vitolo was brought down in the box by Jordan Lukaku on the hour mark. Referee Benoit Bastien had no hesitation in pointing to the spot, and Silva stepped up to send Courtois the wrong way from 12 yards - in the process drawing level with legendary striker Emilio Butragueño on 26 goals for Spain. Kevin de Bruyne forced a fine save from an otherwise underworked David de Gea late on, but for Martínez - whose team begin their qualifying campaign against Cyprus on Tuesday - it was a start to forget as the final whistle brought a chorus of jeers from the home fans. Peeeeeeep! It's all over! 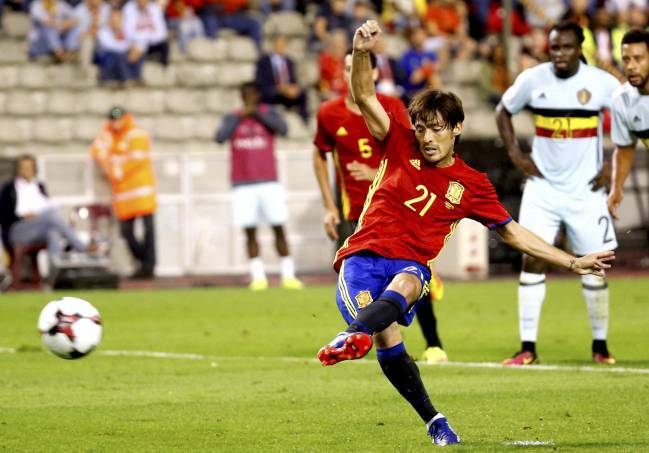 Julen Lopetegui's Spain reign gets off to an excellent start in Brussels. David Silva's two goals either side of half time give La Roja a thoroughly deserved 2-0 win over Belgium, who - to say the least - were very much second best. Min 90 | Three minutes of added time. Costa fires a neat cross-field ball inviting Vázquez to put on the after-burners down the right wing...but the Real Madrid man miscontrols and it's out for a throw-in. Replays then show the young Galician giving himself a stern ticking-off. Min 87 | Belgium boss Martínez shuffles his pack once more, throwing on Steven Defour for De Bruyne, to a chorus of whistles from the fans. Plenty are taking their leave well in advance of the final whistle. Carvajal came off for Sergi Roberto a couple of minutes ago, I neglected to mention. Min 84 | Another shooting opportunity for De Bruyne in a similar position, but it's off target. De Gea looks to be OK.
Min 81 | Belgium enjoy a prolonged period of possession in the Spain half, but it's all very plodding as the hosts huff, puff and finally send a misplaced pass out of play, much to the derision of their home crowd. Lopetegui applauds the defensive discipline of his charges. Min 79 | Ufff! Spain twice get the ball into the Belgium box, and on the second occasion it finally bounces towards the arriving Koke. He winds up to thrash it towards goal, but it flies past the near post. Shame. Min 77 | Belgium with another sub, Carrasco coming off to be replaced by Kevin Mirallas. Min 75 | Hazard whips in a cross towards Carrasco, but the Atleti winger never even looks like getting his head on it. Spain make their subs, with Silva coming off to a fully merited ovation, and Vitolo also making way. Saúl and Vázquez on. Silva's second goal drew him level with Spain ledge Emilio Butragueño on 26 internatoinal goals, by the way. Min 73 | Lopetegui is preparing to bring on Saúl Ñíguez for his international debut, with Lucas Vázquez also readying himself to come on. Min 72 | The home fans ain't happy. Not without reason: Belgium have been very ropey. Min 70 | Spain are after a third, and Silva drifts it to Koke at the back post, where the Atlético midfield could have shot, but instead opts to cut it back in the direction of Costa. The commentary team on Spanish TV are screaming it Koke to have a dig! Min 67 | Belgium make a second substiution, and there's a roar of approval from the locals as Romelu Lukaku trots on to the field in place of Origi. Midway through the second half, and Lopetegui couldn't really have hoped for a more comfortable night in Brussels. Min 66 | Gah, that's horrible from Courtois. The Chelsea keeper sets himself to control a routine back-pass and it pings back off his boot and out of play. Sums up Belgium's night. Min 62 | Gooooal to Spain! Silva steps up, and sends Courtois the wrong way! 2-0 to Lopetegui's men! Two for the little City maestro! Min 61 | Penalty to Spain! Vitolo skips into the box and skins Lukaku, who brings the Sevilla player down. It's a stonewall penalty, and Monsieur Bastien doesn't have to think about that one twice before pointing to the spot! 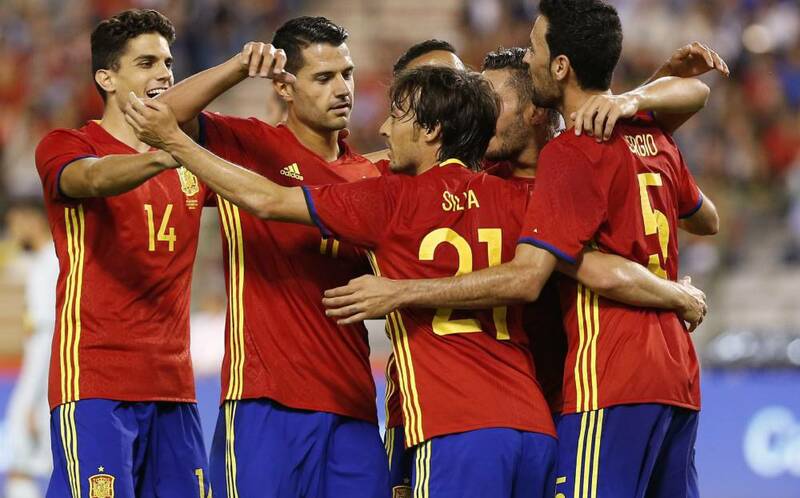 Min 60 | Double change for Spain, as Marc Bartra and César Azpilicueta come on for Gerard Piqué and Jordi Alba. Back on the pitch, Koke's volleyed pass meets the run of Costa into the box, but the Chelsea man can't quite bring it under his spell to shoot. Min 58 | Real chance for Costa there! Busquets feeds a simple through ball that has the striker running in behind the Belgian defence with Alderweireld trying - and failing - to keep up...but his angled shot on the run is mopped up by Courtois. Could have been two. Min 55 | Spain play it about and look in complete control. Silva almost feeds Costa just outside of the box, but can't quite find the striker. The away side come again, though, and Costa is in the thick of it once more, winning a free-kick in shooting territory. Ramos stands over it, but his effort nicks a Belgian head and is away for a corner, which finds Piqué - but the defender can't get a good header on it. Min 50 | Carrasco elicits a roar of optimism from the home crowd with a forward break, but the cheers swiftly turn to groans as his cross-field ball is easily sweeped up. Belgium come again, but Lukaku slaps a cross miles too long. Cue further groans. Min 47 | Should be two! Spain win a free-kick on the right, in prime territory for Koke to deliver. That he does, and finds the head of Piqué, who bullets it towards goal, only for Courtois to tip it over! Min 46 | Spain start the second period as they ended the first - on the attack. Costa really does look seriously up for this, and links up with Silva before getting a shot away - but it isn't troubling Courtois. Belgium make a change, with Moussa Dembele coming on for Nainggolan. The second half gets underway! Peeep! That's half time at the King Baudouin Stadium, and from where I'm sitting - in an office block in Madrid, admittedly - that sounded like whistles from the home fans. After a relatively even opening, Spain took a greater and greater stranglehold on the game as the half progressed, and fully merit their lead. Diego Costa, on midway through the period for the injured Álvaro Morata, had a very positive 20-odd minutes there. A promising start for Señor Lopetegui; for Señor Martínez, meanwhile, plenty of food for thought. Min 46 | De Bruyne tries to get Nainggolan away on the left, but Spain deal with the danger with the minimum of fuss. Min 45 | One minute of added time in Brussels. Spain are after a second before the break here. Min 42 | It's all Spain, and Martínez has a look of not injustified concern on his face. Costa has a shooting chance on the left of the box as red shirts pour into the penalty area - but he can't get a good connection. Min 41 | Spain are getting no shortage of joy through Carvajal's forward charges on the right: this time it's Gerard Piqué who locates the Real Madrid right-back, who gets himself running into the box behind Hazard, but is dispossessed just at the final moment. Min 39 | Undeterred, Spain come again with Thiago feeding a looped ball over the top to find the run of Carvajal, who lets it bounce before volleying a cross towards the danger area - but it's cut out. Min 38 | Costa is released in the left-hand channel but, with Belgium backpedalling, tries a trick and makes a hash of it. It's been a very encouraging 20 minutes or so from the Chelsea man nonetheless. Min 34 | "A deserved goal," says former Spain coach José Antonio Camacho on TV. Spain had certainly been looking the likelier of the two in the last ten minutes. Min 33 | Gooooal! And Spain take the lead! Carvajal plays a lovely slide-rule pass to meet the run of Vitolo, who rounds Thibaut Courtois. He's pushed wide and cuts it back across the face of goal, where Costa tries to control, but in the process lays it off to Silva to crash it low into the net! 1-0 to Spain! Min 31 | So far there have been six draws in Belgium and Spain's 22 meetings down the years - as things stand, we're heading for a seventh. However, La Roja have looked the livelier in the recent minutes. Substitute Costa clearly has the bit between his teeth and is already playing an active role in attack. Min 30 | Shame. Costa exchanges a lovely one-two with Silva and bursts into the area but, before he can find half a yard to get a shot away, a combination of Toby Alderweireld and team-mate Sergio Ramos scotches his designs on a second international goal. Min 28 | Costa is immediately into the action, Koke releasing his former Atlético Madrid colleague to feed the run of Vitolo surging into the box, but Jordan Lukaku produces a textbook, clean challenge on the Sevilla man and the threat is over. Min 26 | Belgium enjoy a spell of - not terribly dangerous - possessoin as Spain wait to make their enforced change. And here comes Costa for his first Spain appearance since November last year. Min 22 | Ooh dear... Zinedine Zidane's heart will currently be very much in his mouth. Morata is down after appearing to pìck up a knock as Carrasco conducted a somewhat eager attempt to win the ball back from the Real Madrid man. He's limped off...and he's going to be replaced by Diego Costa! Min 20 | Thiago volleys wide! Silva looks up and crosses from his position on the left - Vitolo is hugging the right flank - and the ball is headed away only as far as the Bayern Munich man, who slaps wide Spain's clearest shooting opportunity thus far. Min 14 | Now it's Belgium who have the chance to whip in a dead-ball delivery from a similar position up the other end of the pitch, but Kevin de Bruyne's cross is headed behind for a corner, which comes to precisely zilch. Min 12 | Spain win a free-kick on the corner of the penalty area, which David Silva swings in but sees headed away, Thiago then looking to get the Man City man scuttling in behind Hazard. However, he can't control and it's out for a goal-kick. Min 8 | First brief moment of danger from the visitors as Jordi Alba gets himself into a position to fire in a low cross from the left-hand byline, but Vertonghen is quickly there to clear ahead of the lurking Álvaro Morata. Min 6 | First opening of the match, and it goes to the hosts! Hazard bursts forward on the left and sees his cross fumbled by David de Gea, Yannick Carrasco then laying it back to Axel Witsel to fire low - but wide - from the edge of the box. Min 3 | The last time the sides met, in 2009 in La Coruña, Spain gave Belgium a right old walloping as they ran out 5-0 winners - but that was a Belgian team with a somewhat less liberal sprinkling of star dust. Indeed, only Eden Hazard and Jan Vertonghen survive from that starting line-up tonight. Min 1 | Lopetegui has vowed to get his side dictating the play like the all-conquering Spain of recent years, while both new bosses have spoken of a commitment to keeping a hold of the round thing. So it makes for an intriguing battle tonight. Peeep! Monsieur Bastien gets us up and running! Three minutes to kick-off | The hosts are up next, and new boss Roberto Martínez clearly hasn't found the time to learn the words yet. Tish tish. Five mins to kick-off | And the teams make their way out onto the turf at the King Baudouin Stadium... Anthem time. Spain first. Ahead of the important World Cup qualifiers, tonight's clash is a friendly match which has been postponed since its originally planned schedule at the time of the attacks in Paris. It's a game between two talented squads who are both going through a period of rebuilding, in terms of personnel and belief. After their 3-1 elimination at the hands of Wales in the quarter finals of Euro 2016 the new man at the helm of the Belgian national side is Spaniard Roberto Martínez. After getting his feet under the desk he has since brought in ex-Arsenal and France legend Thierry Henry as his assistant. 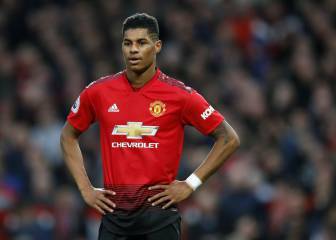 How they will work together and what they can bring to the side could be an interesting story, but most fans of the Red Devils are optimistic that it will be better than the previous regime under Wilmots. In this new period for the team one thing remains the same: the quality of players at their disposal. The squad is bursting with talent with many of the players strutting their stuff at top clubs around Europe. With a potential frontline of Lukaku, Hazard, and De Bruyne it should prove a good test for the Spaniards. Spain also have a new coach in the form of Julen Lopetegui and this match will give him a chance to try out some different combinations of players and style ahead of the first qualifier against Liechtenstein and then, more importantly, Italy. A poor showing in the Euros on the back of the pain of the last World Cup means that a key objective for the coach is a return of confidence to the squad and he has said himself that the team need to start dictating games in the way they used to. With Casillas, Juanfran, Iniesta, Cesc and Pedro all absent from the squad Lopetegui is putting his own faith in a new generation albeit that the expected starting eleven will look rather familiar. Sergi Roberto, Mata, Carvajal, Diego Costa, Alcácer and Asensio will all look to get some pitch time and Atlético's Saúl may be handed his debut for the national side. Aside from the match itself, with recent events in Belgium, the terrorist alert remains high in the capital and security will be tight.